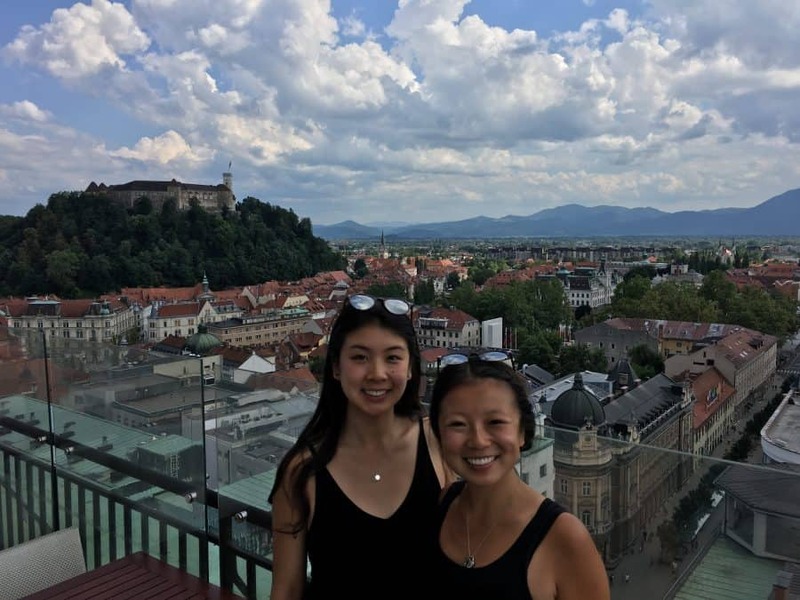 For the second stop on mine and Diana’s second annual sister trip, we decided to go to Ljubljana in Slovenia, a largely underrated travel destination. We were scheduled to take a direct bus from Rome to Ljubljana, but despite our best efforts to catch it, we ended up missing the bus. As a result, our cheapest and quickest option was to take a train from Rome to Venice, and transfer to a bus from Venice to Ljubljana. The bus leaving from Venice was delayed by around two hours, which brought our arrival time in Ljubljana to over six hours later than we’d initially scheduled. 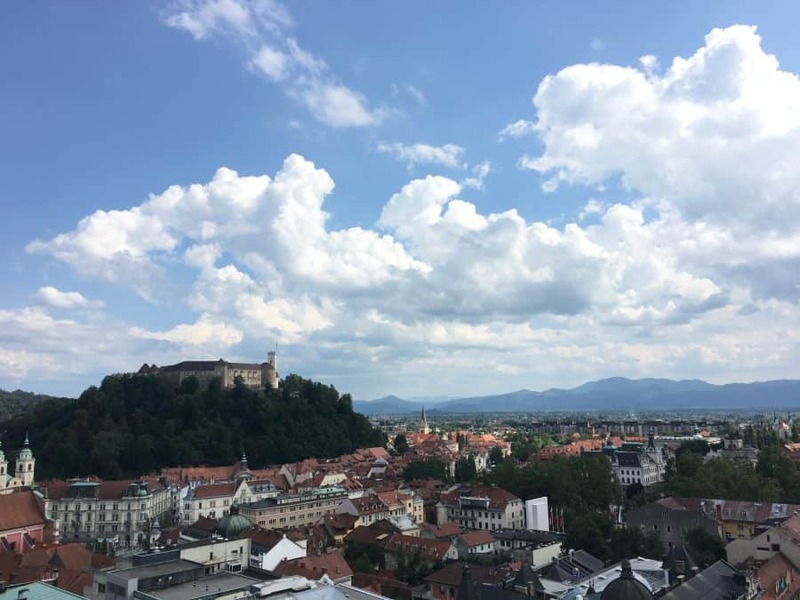 Despite the cushion room we left between our arrival time in Ljubljana and the start of the food tour, we still missed two out of our five chances to explore the tastes of Ljubljana with Taste Ljubljana’s culinary tour. For the two restaurants that we missed, some members of our group were kind enough to send us pictures they had taken of the food, so the next few pictures are credited to them. 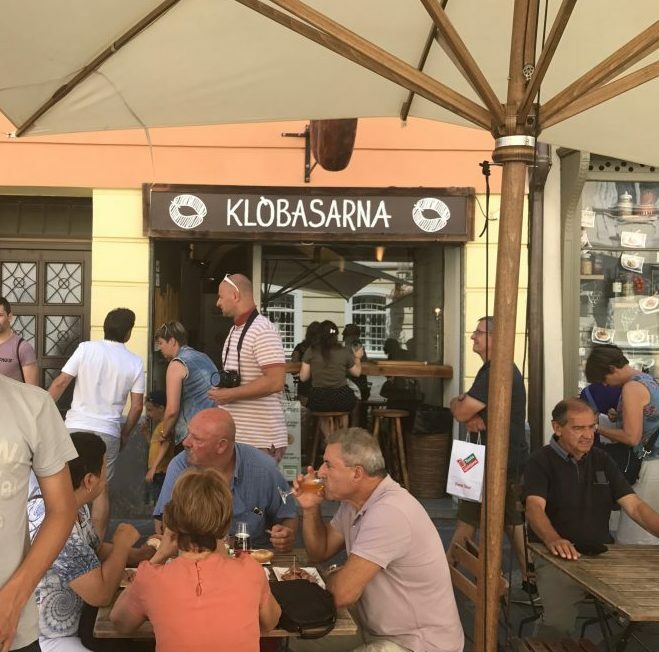 The first of the two restaurants we missed was called Klobasarna. Klobasarna is famous for its Carniolan sausage (kanjska klobasa in Slovenian), which is very similar to the Polish kielbasa. The sausage primarily consists of pork and bacon, and the remaining ingredients, such as salt and garlic, are only there to enhance the taste. 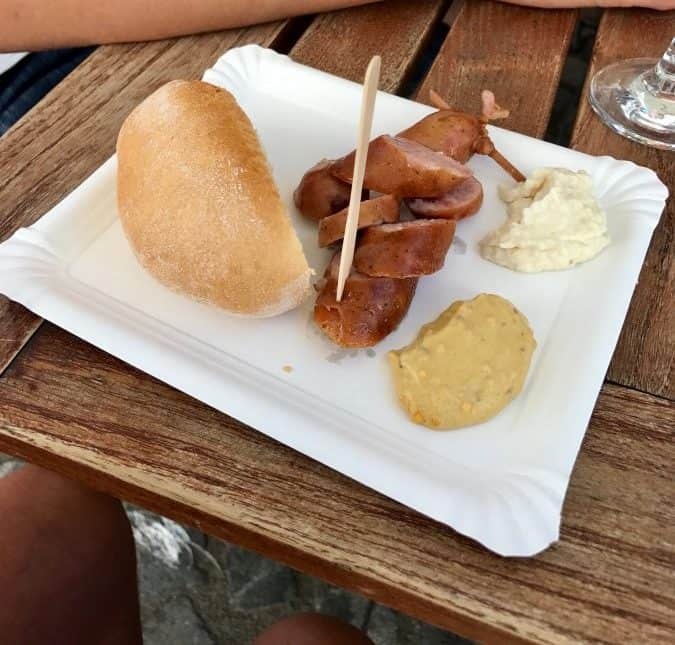 Our group had the opportunity to sample these Slovenian sausages and were also given a glass of red wine made in local vineyards. 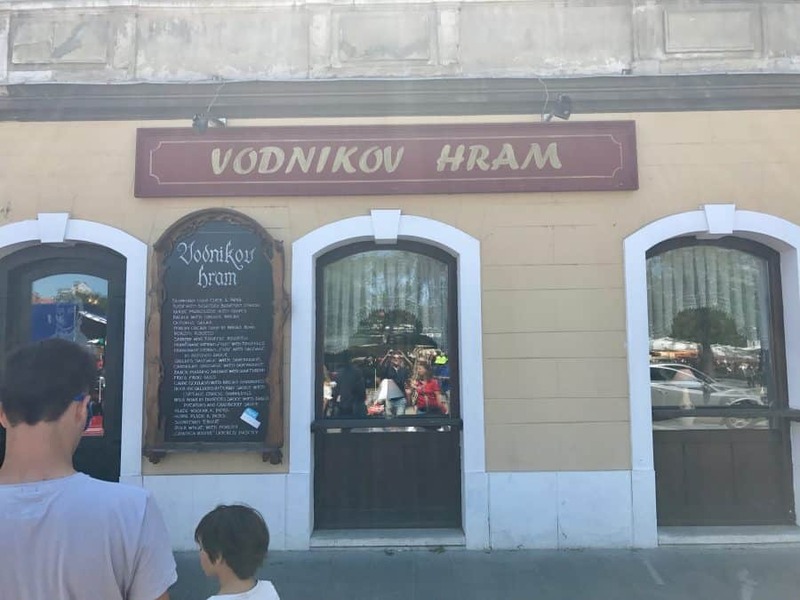 The next restaurant the group went to was Vodnikov Hram, a restaurant known for its authentic Slovenian cuisine. The group tried a more experimental dish here: beef tongue. Like the first stop on the tour, each member of the group again received a glass of wine to accompany the dish. 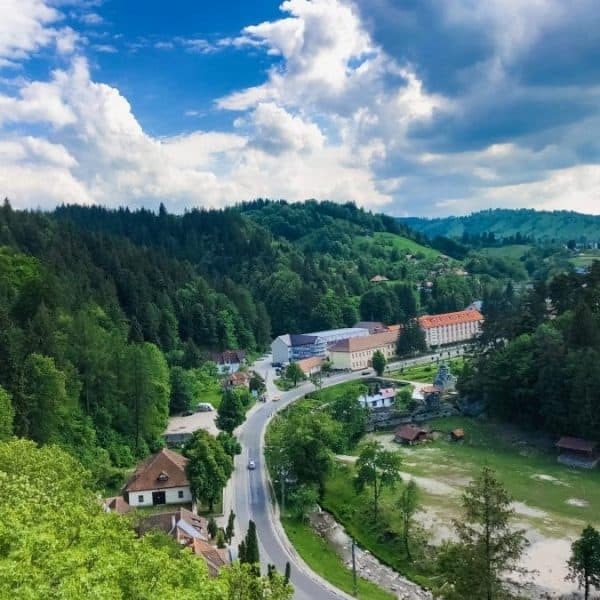 After we arrived in Ljubljana we immediately contacted the Ljubljana Tourism Board, and they called our guide Karmen to tell us where we could meet them. Karmen told us to meet them at Druga Violina, the third restaurant on the tour, which thankfully was only a short walk from our hotel. We made it before the food was served, and while we were waiting, Karmen gave us our complimentary goodie bag consisting of a spatula and cookbook on Slovenian dishes, as well as a rundown of the places we had missed. She explained that Druga Violina is one of a few restaurants that only employs waiters and waitresses with special needs. We love supporting local businesses when we travel, especially when the local business promotes meaningful causes like this that directly support the community. Finally, we were able to try our first dish on the food tour, pražen krompir. 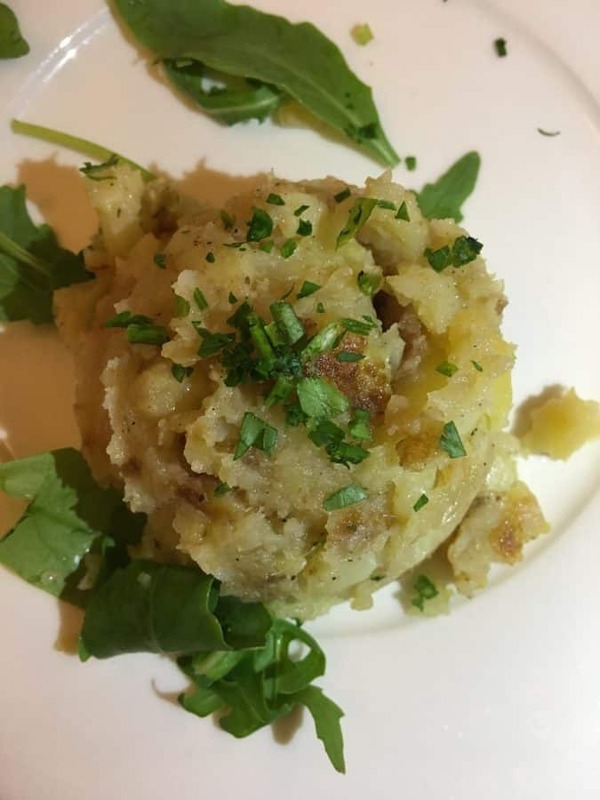 This is a potato based dish mainly made with onions, beef broth, and parsley, and is typically served as a side at the restaurant. We were also each served a locally brewed beer, which complimented the krompir very nicely. 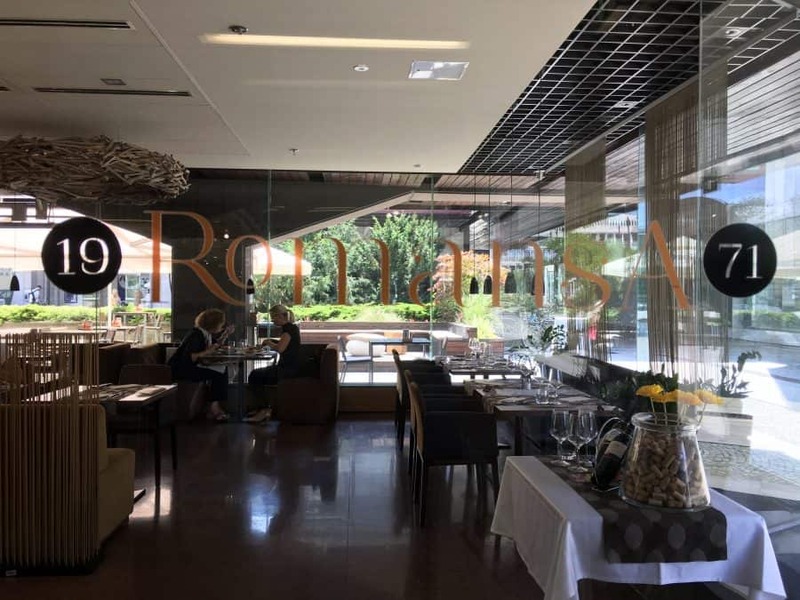 Our next stop was Romansa, a restaurant with a contemporary design, an open kitchen concept, and a garden terrace for warmer days. Romansa has a fairly wide selection of vegetarian and vegan dishes, and I would highly recommend the restaurant for non-meat eaters. Ironically, right after Karmen told us about this, we were served a dish with both meat and dairy in it. 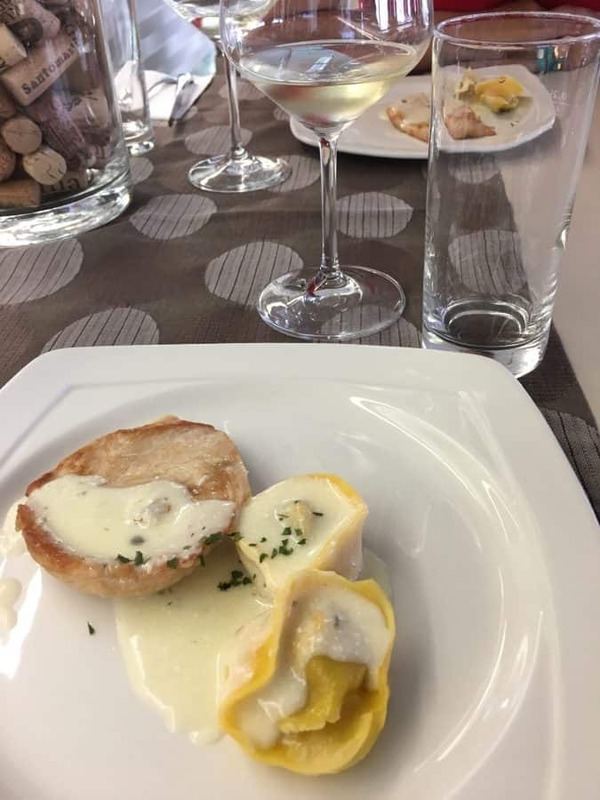 We were given a slice of pork and a portion of tortellini with various fillings, and had it topped off with a glass of locally made white wine. The walk from Romansa to our next destination was farther, so we passed by many landmarks on our way there. Karmen told us about buildings such as the Slovenian parliament, and she also brought us to an area where we saw peacocks roaming around. The final stop on our food tour was the skyscraper in Ljubljana, also known as Nebotičnik. We squeezed into the tiny elevator and made our way up thirteen stories to the top of Ljubljana (some of us walked up the picturesque staircase). 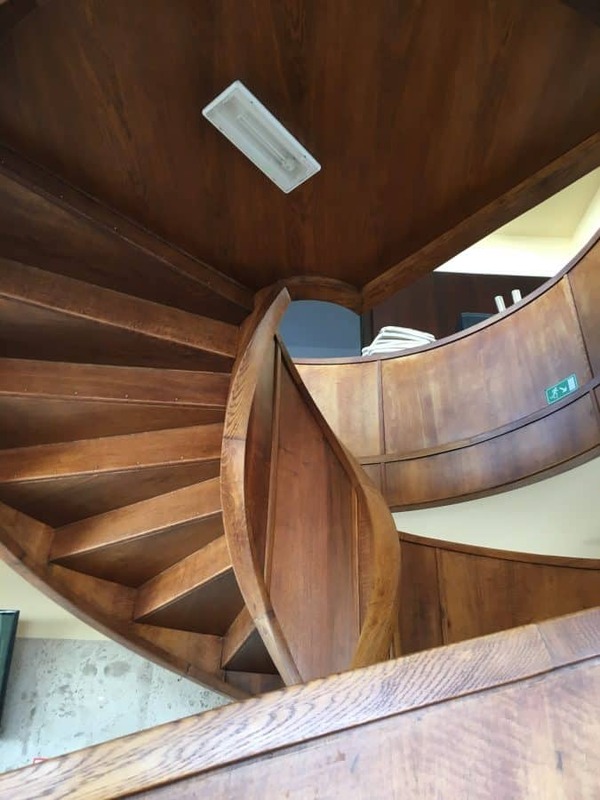 The building itself has a multi-purpose use. It contains shops, residential homes, offices, and of course, a café and bar. We made our final stop at the café, located on one of the top floors of the building. We chose to sit outside, where the only thing standing between diners and an incredible view of Ljubljana is a thin railing. 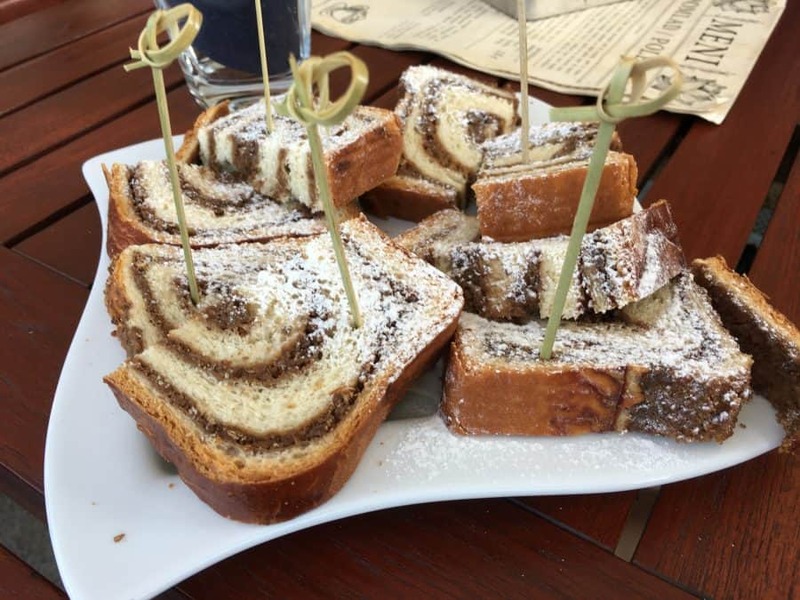 We enjoyed potica which, when cut, slightly resembled a dryer cinnamon roll. The potica is made with the same ingredients as traditional cakes, but it has different flavours of filling within its rolls. We had a choice between either tarragon or walnut flavoured potica. I liked the walnut more than the tarragon, but in general, I wasn’t a huge fan of the potica. We were also given samples of either blueberry or walnut schnapps. I tried and enjoyed both, but they were definitely stronger than I’d expected. After we finished eating, drinking, and chatting, our lovely tour guide Karmen parted from us, but she encouraged us to stay for as long as we wanted on top of the skyscraper. We happily obliged and walked around the entire circular cafe terrace, which afforded us stunning panoramic shots of Ljubljana. 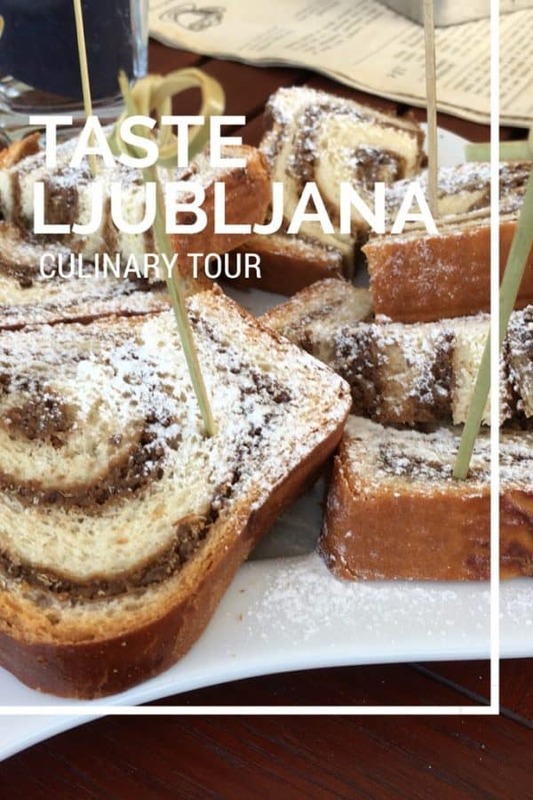 Even though we missed part of the Taste Ljubljana culinary tour, we still had a fantastic time exploring the tastes of Ljubljana with Taste Ljubljana’s culinary tour. The tour is held every Wednesday and Saturday at 12 PM and lasts for three hours. The cost is 38 euros for adults and includes five dishes, five drinks, a digestif, and the spatula/cookbook souvenir. Children aged 2 to 12 can enjoy the tour for 28 euros, and children under 2 years old are free. 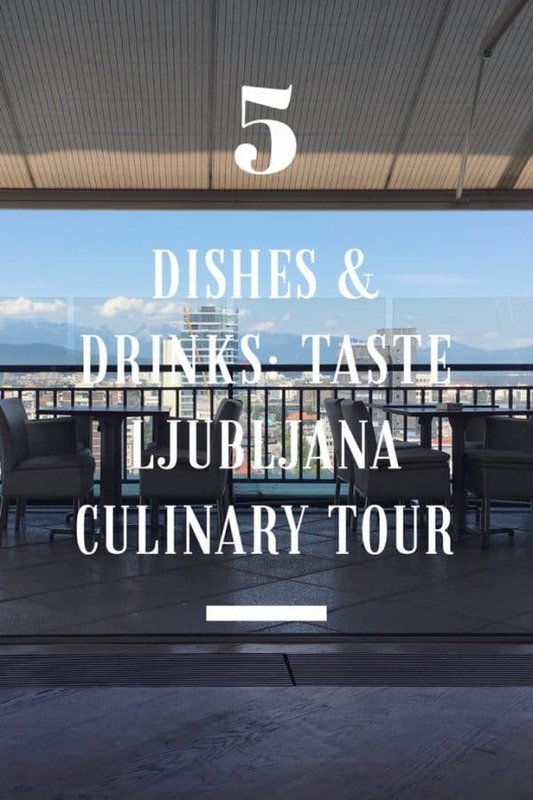 It is definitely worth the experience and added knowledge of both Slovenian cuisine and culture, and we’d recommend this tour to anyone visiting Ljubljana. Book your tour here! Wow, this culinary tour looks amazing. And affordable! Although I have to say, I don’t think I’m adventurous enough for beef tongue. However I really want to try the potica. Quite interesting. I am a big foodie and drooling already. I like that there is a wide range of vegan options available. Most of my personal trips are tailored around good wine and great vegan food. I am glad this place offers both. 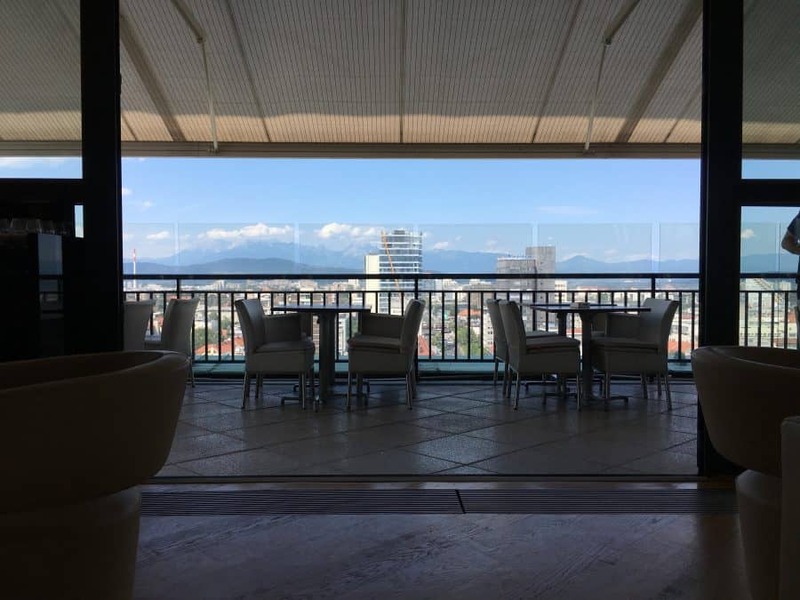 I would love to sit in the al fresco café and soak in the views of Ljubljana. This culinary tour makes me hungry .. LOL. I would love Romansa as it has vegetarian options and being a vegetarian I would prefer it. Potica also sounds tempting because of cinnamon flavors. The panoramic view from top of Ljubljana is amazing. 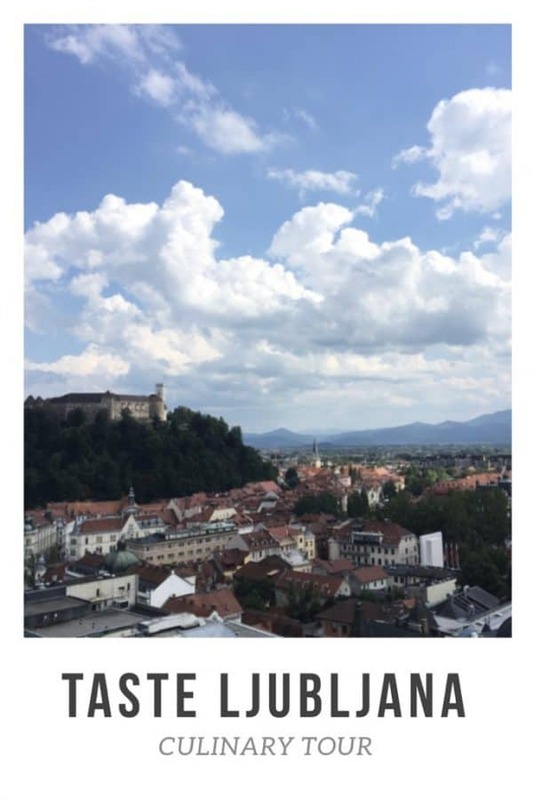 I agree Ljubljana is such an underrated destination! We adored it when we visited last year. 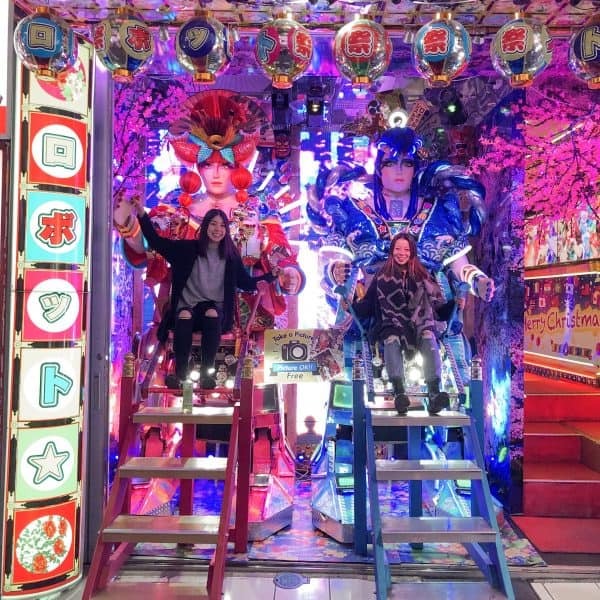 I would love to do a food tour on our next trip–some of those dishes look incredible! I wonder how the beef tongue tasted. It is a good thing they mostly serve these with a glass of locally made wine to wash down the food. I have heard of potica, I will definitely want to taste them when I am in Slovenia. 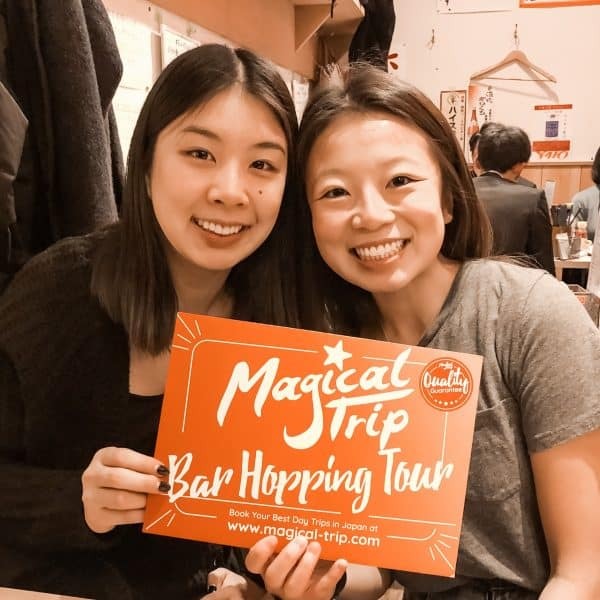 When it comes to culinary tours, sign me up real quick! I love exploring about a country’s culture and history through food. And I don’t know much about Ljubljana so a food tour is a great way to learn more about the city!